1948 Born in Hadera, Israel to Abba and Vitka Kovner. Raised on Kibbutz (collective settlement) Ein-HaChoresh. 1954-1966 Elementary and Secondary Education on Kibbutz Ein-HaChoresh. 1955 Accompanies Vitka, his mother, on a trip to Europe to meet his father who was absent from Israel for a year. A seven year old boy discovers the world of art. 1958 A birthday gift of oil paints and an art lesson from his father jump starts an artistic career. 1966-1967 Following High School graduation, works with youth groups outside the Kibbutz. 1967 During the Six-Day War (June 1967) returns to the Kibbutz to take charg , with fellow Kibbutz youth, of all agricultural work while most of the Kibbutz adults are mobilized for the war. 1967-1970 Military service in an elite army unit. 1970 Following military service, travels to the USA with army buddies. Following a visit with family friends in Los Angeles, California, makes a crucial decision to pursue art as a vocation and to take up his studies in New York rather than in Israel. 1970 Meets Mimi Makover, his future bride. 1971 Works as a security guard for Arkia Airlines while studiying in evening classes at the Avni Institute. 1972-1975 Studies at the New York Studio School. Influenced by the teachings of Philip Guston, Jack Tworkow and Mercedes Mattar. 1973 Returns to Israel for the Yom Kippur War (October  December 1973). 1974 Despite the terrible loss of many friends during the war, comes to the painful decision to return to his studies at the New York Studio School, and with other advanced students under the guidance of a talented young painter, Steven Sloman, forms a group that works independently, often in the countryside or at the seashore, critiquing each other’s work. 1975 Returns with Mimi to Israel (via Spain, Southern France and Italy) and embarks on a life of an artist, albeit not yet fully formulated. Mounts first exhibition of his New York works at the Jerusalem Artists’ House. Joins Bezalel Academy of Art and Design as an art instructor and the American-Israel Foundation scholarship committee. 1976 Marries Mimi Makover. Jointly decide to make Jerusalem their permanent home. 1977 First child is born  a son, Amikam. Studies Judaism with Rabbi David Hartman at the Shalom Hartman Institute in Jerusalem. 1978-1980 Explores new artistic directions with a series of bird’s-eye-view landscapes painted from aerial photographs and desert vistas painted in the outdoors. Begins his relationship woth the Bineth Gallery in Tel-Aviv. Mounts two successful shows at the Gallery  desert paintings and an exhibition of drawings. 1981 A second son is born, named Nimrod. Bineth Gallery exhibits a new series, “Houses in Gaza”. Exhibits in the Tel-Aviv Museum group show “Turning Point”. The Israel Museum in Jerusalem acquires a painting “House Painted with Flowers” for its collection. 1982-1984 Inspired by his two sons playing with the Lego building blocks, exhibits his “Lego” series at Tel-Aviv’s Gordon Gallery. Bineth Gallery refuses the Lego series and terminates its relation with Kovner. 1985 Returns to Bineth Gallery in Tel-Aviv with an exhibition of his portraits of wife Mimi and friend Michal. 1986 Expands from his tiny studio in family residence into a more spacious work area in Jerusalem’s north eastern neighborhood of Pisgat Zeev. 1988 Exhibits at Bineth Gallery his series “Jerusalem Hills”. First major initiative of painting directly in nature. 1990 Exhibits at Bineth Gallery his follow-up series “Jerusalem Scenes”. Acquires a small two-room apartment in the Katamonim section of Jerusalem for a permanent studio space. 1992 Exhibits at Bineth Gallery “A Girl in a Room”, painting his son’s young adolescent girlfriend. 1994 Returns to landscape painting. Develops close friendship with artist Jan Rauchwerger. Touring together in Romania along with sculptor Zvi Lachman. Continues with Jan to Lonon and then to Holland to view the Cezanne and Vermeer exhibits. 1987-1994 During this period is strongly effected by several family related tragedies, including the death of his father, poet Abba Kovner. He is thus preoccupied with death, which is fully explored in a series of paintings titled “Sataf” that have never been exhibited. 1995 Bineth Gallery mounts an exhibition “End of ‘95”, an exploration of the Beit Shean Valley  its reservoirs, fishponds, birds and cows. Publishes a large catalogue of works, 1985 - 1995. 1996-1997 Exhibitions in New York, Washington DC and in New Haven, Connecticut. 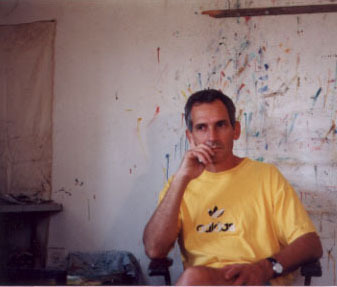 1998 Together with artist friend Jan Rauchwerger paints the port of Ashdod. The paintings are exhibited in Museums in Haifa and Ashdod. 2000 D.K. GraubArt Publisher Ltd., Jerusalem publishes “Portscapes” and puts out a limited edition of etchings “Port”, interlaced with Hebrew poems about seaports. 2000-2001 Returns to the Beit Shean Valley; deals with the relationship between water and sky and paints the fish ponds and reservoirs in a series entitled “Lakes”. Jan Rauchwerger asks Kovner to share a studio in New York City where he now works for three months each year. 2002 Meir Aharonson, curator of The Museum of Israeli Art, Ramat Gan, suggest an exhibit of all works entitled “Landscape”. 1978 "A Bird's Eye View - Landscape Drawings", Bineth Gallery, Tel-Aviv. "Paintings from New-York", Artists House, Jerusalem. Awarded Fellowship to study in New York by the American-Israeli Cultural Foundation.